EToro is one of the oldest CFD brokers and is headquartered in Greece. According to his own data, the online platform is one of the world’s largest investment networks, developed for private traders. Differential contracts on equities, indices, commodities and currencies can all be traded. EToro self-developed social trading applications which madethe broker clearly stands out from the crowd. The combination of low entry barriers and a simple designed trading interface appeals to inexperienced traders. Thanks to numerous features, the CFD Broker is also suitable for advanced and professional traders. EToro’s trading offer remains rather manageable compared to other Forex and CFD brokers. Traders have the choice between 16 tradable exchange pairs. This includes all major currency pairs. In addition to trading in currencies, traders can trade with eToro CFDs for around 50 different stocks, a few important commodities and 6 indices. With other brokers, the selection is a lot bigger. Due to its policy, eToro is limited to the most important underlyings and this of course is crucial for inexperienced traders. In addition, eToro customers benefit from a high leverage ratio. Leverage of maximum of 1: 400 means that the traders can make very large profit with small investments. The leverage ratio is larger than with most brokers. On average the leverage is at 1:50. A spread of 3 pips is levied on major currency pairs. In general, trading with pairs of currencies from 2 pips is possible. sToro refrains from taking any commissions and adding additional fees. In addition to the usual trading options and functions, eToro offers its customers also the social trading. Inexperienced traders can learn about all the activities of the successful traders. Afterwards, you can automatically copy strategies with the software that you think are recommended. This is a real treat and is featured with any other Forex or CFD broker. 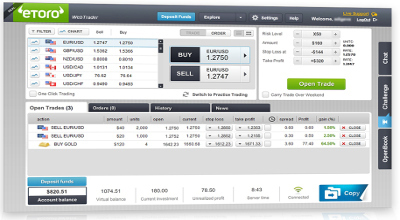 The trading platform is another great feature of eToro. This was specially developed and differs significantly from the known trading platforms. The two applications OpenBook and CopyTrader are the heart of the platform. With the eToro OpenBook, traders can track the trading of other users in real-time and, if desired, carry out the same trades on their own trading account. The CopyTrader allows eToro’s customers to connect the trades of the other platform users directly to their own trading account via a special interface and also to transfer them automatically. The specially developed eToro trading platform leaves a clearly structured and very clear impression and is ideal for beginners. The trader does not have to install any software on the computer and can access the platform directly from the Internet browser. In addition, eToro also offers its customers a special app for mobile devices. This is also free of charge and can be used on both smartphones and tablets. New customers can get to know the trading platform and the trading possibilities without risk and costs by using the demo account. It can be used indefinitel. Users can trade with a virtual credit of 10,000 euros. In addition, new customers benefit from attractive bonuses and benefits. For the first deposit, customers receive a generous bonus. The amount depends on the amount paid. 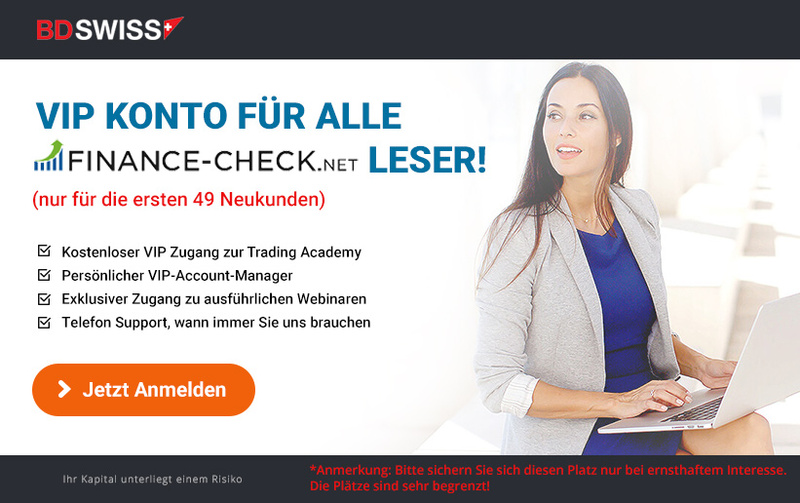 The traders receive a maximum of 1,000 euros on their trading account. In addition, existing customers also receive a bonus on larger eToro new systems. Customers who recommend the broker are rewarded with attractive premiums by eToro. 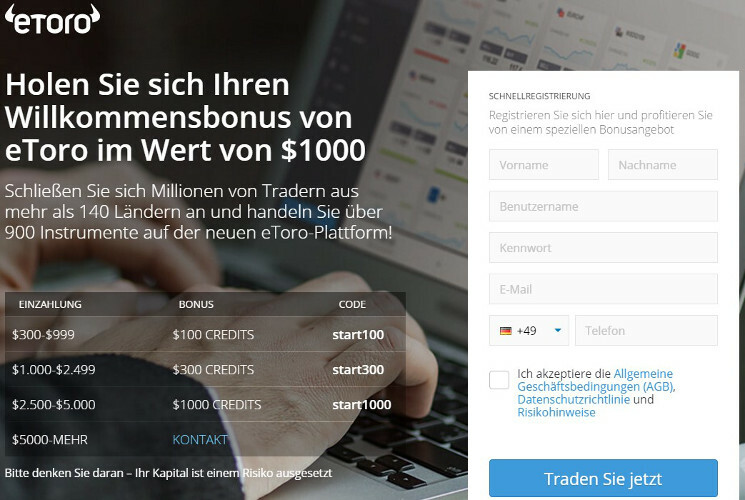 A new account at eToro can be created within a few minutes and without great effort. To open an account at all, new user has to invest at least 50 euros. This means that the minimum deposit is much lower than with most other brokers. If a new customers pays 1,000 euros or more, their trading account is available immediately and any without waiting time. In case of a lower deposit, the account must be fully verified for security. Therefore customers must send proof of residence and a copy of their ID card to the broker. In contrast to many other brokers, eToro waives many different account models and remains faithful to its clear structure. Customers who deposit 20,000 euros or more will automatically receive a premium account. With such an account, customers benefit from several advantages, such as a personal account manager and a free data feed via eSignal. For placing a deposit, customers have different methods available. In addition to a classic deposit via credit card or bank transfer, the broker also supports Giropay, Skrill, WebMoney, 1-Pay, and Neteller. Depending on the chosen method, the transaction is either instant or within a few business days. In contrast to many other providers, this trader can also make a deposit via PayPal. Traders can use the same methods for the payout. The time and fees for the withdrawal depend on the amount and the method chosen. Up to 25 euros may be charged for disbursements. This is quite high compared to other brokers. At eToro, traders can benefit from a very professional and friendly customer support. The broker’s support staff can be contacted at any time by e-mail and via live chat. The support can be reached on working days from 10:00 am to 3:00 pm. In general, the employees are very friendly and take care of an issue promptly. Many problems and questions can also be solved by eToro ‘s very extensive FAQ section of the website. The answers to the most common questions can be found there. In the eToro’s own trading center, users can find a wide range of different information and training opportunities. These include, among others, free training programs and webinars. There is even some content in German. For inexperienced Forex and CFD traders, the trading center is of course particularly useful. EToro is certainly worthy of its reputation and is one of the best brokers for newcomers and advanced traders. The trading offer is not as rich as other brokers, but all major currencies, stocks, commodities, and indices are available. Thanks to its headquarters in the European Union and strict regulation by the Cypriot Financial Supervisory Authority, eToro is both a secure and a serious provider. An account is created quickly and new customers can benefit from a very generous welcome gift. The referrals are also rewarded with attractive bonuses. Traders can use all common payment methods at eToro and even use the most popular PayPal payment method. The somewhat high fees for payouts clouds the positive overall picture. The specially developed trading platform is very easy to access and offers the traders many useful functions. Customer support reacts promptly and professionally. With social trading, an extremely useful function, eToro stands out from the broad mass of Forex and CFD traders. The information and training offer is also exemplary. Therefore the broker can be recommended to every beginner.